Avocado cucumber salad needs to be on the lunch menu everyday. I just love salads. I mean really love them. I could eat them for all meals for days. And that’s basically what I always need to do for a solid month after I spend time in the US, bouncing around between friend trips and family reunions. And I’ve got both of those coming up in the next few weeks. In just a few days I’ll be flying back to the US after two full months frolicking all over Europe; namely Italy, Greece, Bulgaria, Macedonia and Spain. And first thing I’m doing when I’m home (after seeing my parents and dog of course) is jetting off to Chicago for a girl’s weekend with some of my favorite people in the world. So I’m preparing for some serious feasting and celebrating. I mean once I get together with my friends all traces of self control quickly fly out the window. Tell me I’m not the only one? The word to live by is indulge, and indulge I do. These friend trips only come around a couple times a year so I simply do not hold back on the fun. And for me fun seems to be synonymous with food & drinks. So to offset those weekends I basically need to eat salads until I see my friends again. The phrase – moderation is key, never seems to exist for me during those friend trips. Like I said before, I love salads though, so when I get back from those trips I am always happy to switch my eating habits into all things green and natural. 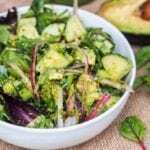 So whenever you need a solid diet detox or just a new salad recipe to add to the mix this avocado cucumber salad has you covered. I mean we’re talking cucumbers, avocados, pesto, red onions, cilantro and mint. Need I continue? Are you in the kitchen yet poking your head into the fridge to grab these ingredients? You won’t regret it. 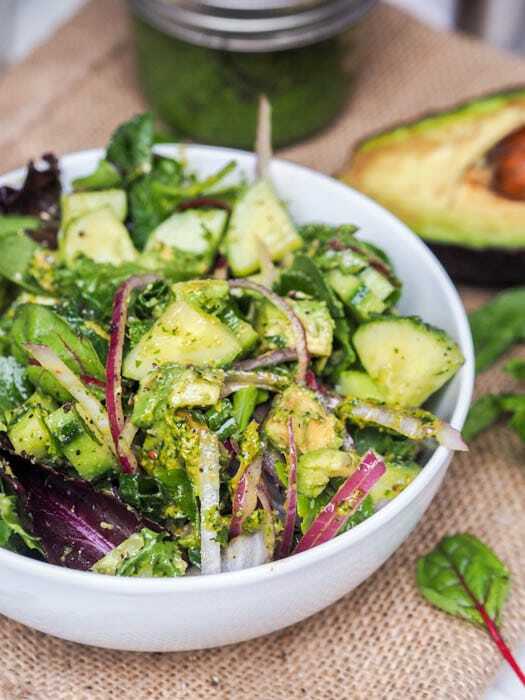 This crispy and crunchy vegan avocado salad is super refreshing without being heavy. The dressing is light and packed full of flavor through the home made pesto (and yes that’s a must) as well as a bit of Sriracha for an added spicy kick. 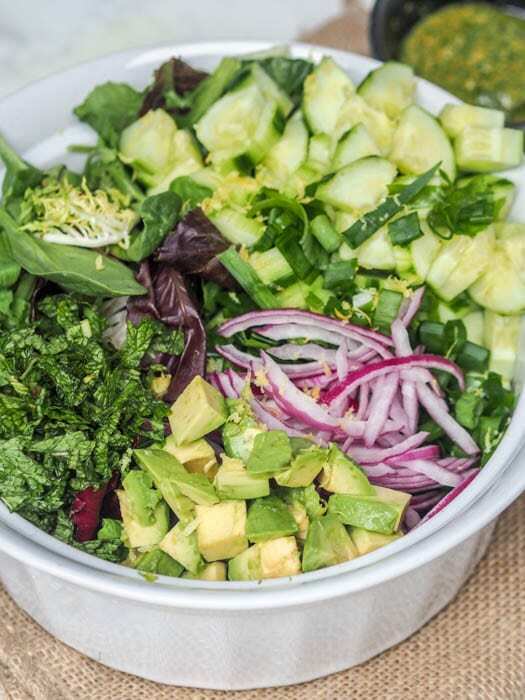 So if you’re like me and choose salads over hour long neighborhood runs, you’ve got to try this vegan avocado salad recipe because you won’t even feel like you’re giving anything up – it’s just that good. Oh and did I mention the entire avocado cucumber salad is ready in under 15 minutes? This avocado cucumber salad would make for the perfect side dish when served alongside my Quinoa Eggplant and Roasted Red Peppers. If you love this salad you’ll also love my Avocado Tuna Boats. 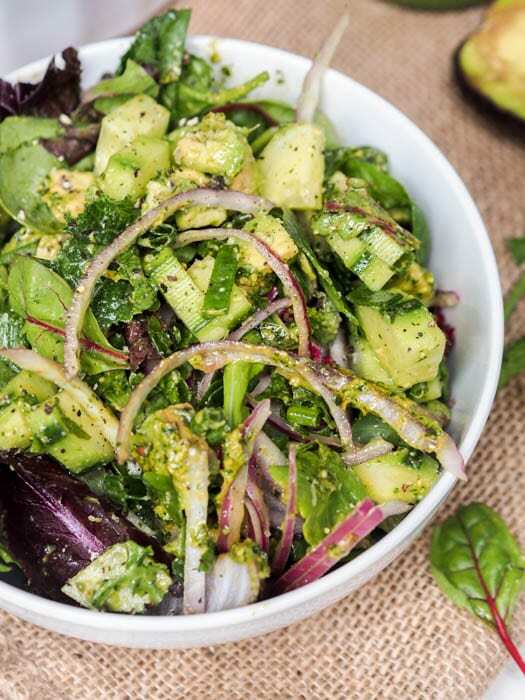 Refreshing salad made with cucumbers, avocados, red onion, cilantro and arugula with the perfect zesty and spicy pesto based dressing. Perfect for a light meal. Gluten-Free and Vegan. Ready in mins. 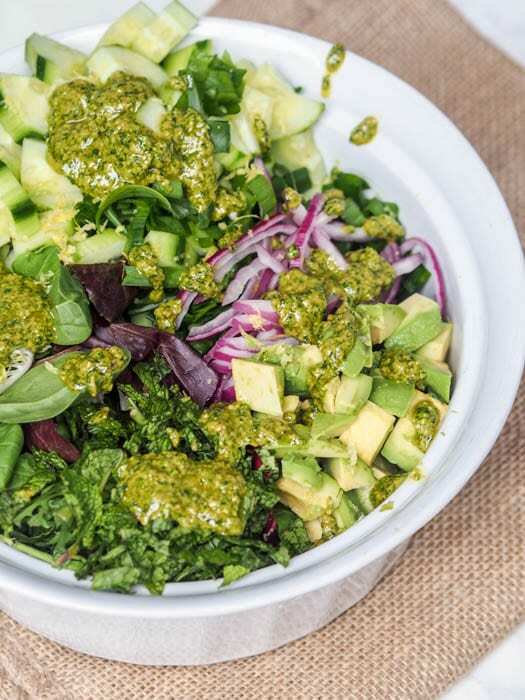 In a large bowl combine cucumber, avocado, red onion, cilantro, and baby arugula. Mix. In a small bowl combine lemon, Sriracha, olive oil, pesto, lemon juice and salt. Serve salad topped with dressing. Peeling the cucumber is completely optional. Sometimes I peel it for a bit of a softer texture because the skin can be a bit tough/rough but this really is entirely up to you. Hope you enjoy the recipe! Looks wonderful! One question though. Do you think this would work for a potluck where it might have to sit for a half day in the fridge before it is taken out? If it’s going to be sitting in the fridge for a while I would add the avocado and the dressing at the end. Just mix the oil sriracha, pesto and lime and place that in a separate container to add right before serving. We need to have a garden party with our two salads today Vicky ~ gorgeous! Oh my gosh what a fun life you have! I am an avocado junkie and love this recipe! A pesto salad dressing sounds amazing. Anything with avocado gets a bit thumbs up from me! Yes anything with avocado gets the same thumbs up from me too! This will be added to my salad list. I love the green colors and adding the cucumber makes it more crunchy. Yes the cucumber adds in a great crunch! Yes the Sriracha adds an awesome spicy kick! I can see myself eating this one, everything in this recipe is perfect and my favourite too, healthy and filling. I never use sriracha, so I dont want to buy a whole bottle. Can I use some Tobasco or maybe freshly chopped red chillies instead? Yes that will be perfectly fine, just drizzle with a bit of Tabasco or just omit it entirely.